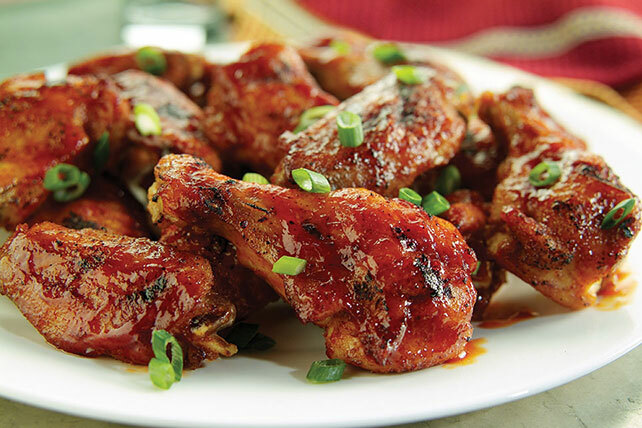 Get ready for game day with Spicy Sesame Chicken Wings! Consider it a good thing if no one is talking while eating these Spicy Sesame Chicken Wings. Mix first 3 ingredients until blended; pour over wings in shallow dish. Stir to evenly coat wings. Refrigerate 30 min. to marinate, turning after 15 min. Heat grill to medium-high heat. Remove wings from marinade; discard marinade. Grill wings 15 min., turning occasionally. Combine barbecue sauce and wing sauce; brush half onto wings. Continue grilling 4 to 5 min. or until wings are done, turning and brushing frequently with remaining sauce mixture. Place wings on platter; sprinkle with onions. Enjoy your favorite foods on occasion, but remember to keep portion size in mind. This recipe makes 8 servings. Omit glass dish. Pour oil mixture over wings in resealable plastic bag. Seal bag; turn to evenly coat wings. Refrigerate 30 min. to marinate. Remove wings from marinade; discard bag and marinade. Grill wings as directed. Serve as dippers with KRAFT Blue Cheese Dressing or KRAFT Classic Ranch Dressing. Sprinkle with 1/2 cup toasted sesame seed before serving.